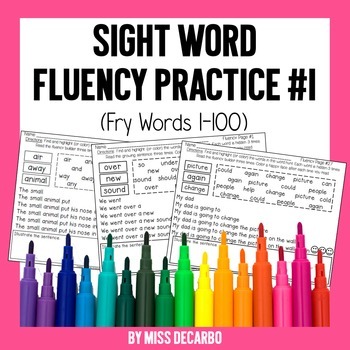 This Sight Word Fluency Practice Pack contains 34 fluency sentences, coordinating flash cards, a pre-assessment, post-assessment, and a teacher tracking page to make it easy to plan lessons and interventions for your class or RTI group! 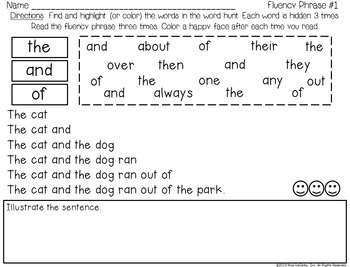 Each fluency page targets 3 of Fry's first 100 sight words. 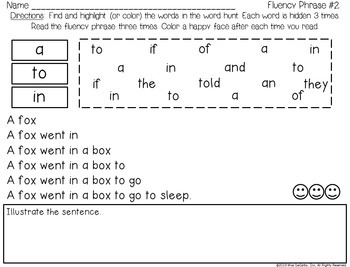 Students will color the targeted words and then find each word three times in the fun Word Hunt box. Then, students will read the sentence builder three times to practice smoothness, rate, and expression. Finally, students will demonstrate their comprehension by illustrating the complete sentence. 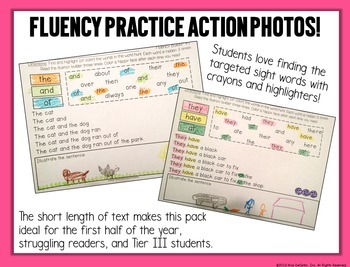 If you liked my Sight Word Fluency Passages for Reading Intervention pack but need a product with less text for your struggling students, more intense repeated words, or, if you just need yet another way for your kids to practice their sight words within context, this pack is for you! The possibilities with this pack are endless. Use them as center work, homework, seat work, as intervention within an RTI setting, as a "brain warm-up" for the beginning of your guided reading groups, or within a tutoring setting. Due to a decreased amount of text, this pack is ideal for the first half of the year in first or second grade, or within the second half of the year in a kindergarten setting! Repeated reading is shown to be a research-based intervention to increase fluency in young readers.